A charm bag is simply a magick spell inside a bag. 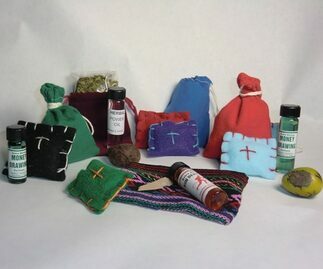 They are spells in a bag and the most popular way of carrying power items with you. To make a charm bag, simply fill with one or more magickally charged items. Magickally charged items may include herbs, stones, charms, drops of essential or magick oils, amulets, and crystals. Charm bags may be as simple as a square of fabric tied together or they may be beautifully embroidered hand made works of art. They may be made of silk, leather, metal,or any fabric. The choice is yours, but keep in mind that the container is part of the spell. Bags with drawstring closures are useful because you can open and close them, adding materials as they are found or needed. A closed bag is called a "hand". Acorn: Luck, prosperity,protection from lightning, and sexual potency. Broom: Brushes away negative influences, sweeps in luck, protection, wealth and good into the home. Clover: Life, luck and abundance. Hammer: Luck and a means of driving out evil. Horn: Repel the"evil eye,'' a symbol of nature and fertility, sexuality. Lightning-struck wood: Protection against all harm. Pine cone: Luck, favourable influences,protection from harm, and sexual power, repels baneful influences. Religious symbol: Symbols of various religions are held to be protective. Salt: Purification, repels evil, and attracts wealth. Silver: Protection, wealth, and the blessing of all Goddesses. Toadstone: Heal illnesses and to repel evil. Toadstone is a fossilized shark's tooth. A bag that has been sewn together is called a "sachet". A sachet is usually made of muslin and may be cut into any shape (to suit the magick), such as a heart or a star before it's sewn together. Sachets usually contain only botanical materials such as herbs and flowers. Instead of using bags or sachets to hold charms and power objects you may use tiny glass bottles. The items inside are visible and may be layered or suspended in oil or seeds. A cord or string may be attached so that the bottle can be worn or hung up. Choose a candle of the appropriate colour to compliment the magick intent of your bag. Carve the same symbol on the candle as is on your bag, or carve a symbol that is sympathetic to your purpose if there is no symbol in your bag. \you may also dress the candle with an oil that is sympathetic to your purpose. Light the candle. Light some incense that also compliments the purpose of the bag. Pass the charm bag over the candle flame and incense smoke to clear it of any lingering unwanted energies before you enchant it with power. Hold the charm bag in your hands and imagine power flowing into you from above. Envision the energy coursing into your arms and will it into your charm bag. As you do this, visualize the desired outcome of the magick bag. See it as complete. This is very important. When you empower any object or spell, always envision the desired outcome, not the steps required or the magick working to make it so. With your will, see the power flowing into your charm bag. Place the charm bag beside the lit candle, so that the candle's magickal sphere of energy is absorbed into the charm bag. Once the candle burns out, your charm bag will be fully charged with your magickal intention.